Cover of Jackson's controversial PhD thesis on Snelling. New South Wales leaders of Docomomo, the international group formed to promote the heritage of modernism, have decided to introduce their members to Douglas Snelling. After almost a decade of cold-shouldering the Snelling PhD research by former RMIT postgraduate student Davina Jackson, the Sydney branch of Docomomo now has invited Jackson to speak on Snelling at its next lecture event. The rapproachment is being brokered by its secretary/treasurer, Louise Cox, who is also immediate past-president of the International Union of Architects. 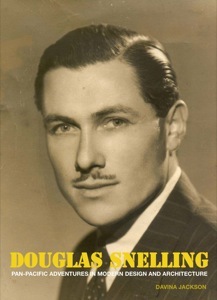 Jackson will present the first Sydney lecture on Douglas Snelling since her research project began in 2003. Snelling's eldest son, Christopher, who leads the Powerhouse Museum's Discovery Centre in Casula, also has been invited to give his recollections. The lecture is scheduled for 5.30pm, 26 March 2013, at the offices of Godden Mackay Logan, 78 George Street, Redfern.